← Reviews on my book – loving these! 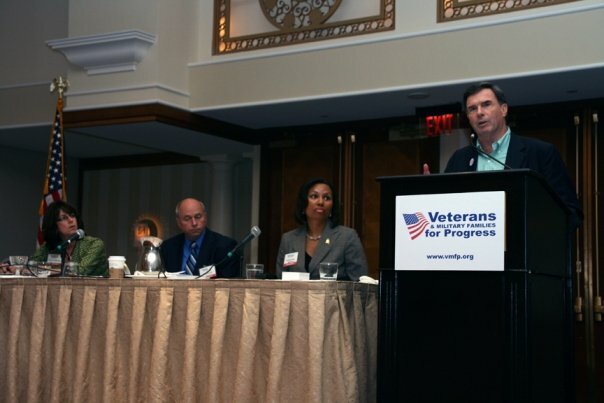 A VMFP panel discussion gets underway at the 2009 Biennial conference in Arlington, VA.
Six years ago this weekend, Veterans and Military Families for Progress held its biennial national conference in Arlington, Virginia. I was a founding member and for several years served on the board of the national 501(c)4 organization. That weekend event hosted high-ranking government officials from the VA, DOD, a number of national veterans non-profits and other agencies and organizations. And it was my great honor to serve as chair of the three-day event. The conference covered weighty issues such as the challenges faced by veterans transitioning to civilian life, reconnecting with their families, and rejoining the workforce. An awards gala recognized the legislative advocacy of Congressman Chris Smith of NJ, former Cabinet Secretary Max Cleland, and Bob Woodruff, the TV News Anchor injured in Iraq. And through a fundraising effort, we were able to reunite and host an entire U.S. Army Fireteam that served together in Iraq. I’d been involved in Veterans causes since high school when I served as a “candystriper” for not one but two local Veterans Administration hospitals in the Nashville area. The fact that my dad served directly under Gen. Dwight D. Eisenhower in the European theater during WWII and an uncle was a Marine officer killed at Iwo Jima added to my desire to serve veterans. But becoming a blue star mom was the thing that confirmed my commitment to this noble but small percent of the population as I endured the deployments of my two sons to Iraq a total of five times. Living in Tennessee at the time, the weekend before that major conference in Virginia, my husband and I were fortunate to volunteer in Operation Stand Down Tennessee’s weekend stand down annual event collecting, sorting and distributing warm clothing for homeless veterans living in the Nashville area who were fortunate enough to be bused to that weekend event. I might sound corny, but my eyes still tear up as I think about those individuals, what they endured and continue to endure because of their service and duty to our nation. In three weeks time it will be Veterans Day. All over the country politicians will be pinning their Old Glory flags to their lapels. I’d like to believe they keep our Veterans and those serving and their families in mind as they ponder legislation, budgets and taxes. I’m afraid that’s not always the case and have found it helpful to follow the legislative updates of non-partisan veterans organizations out there to find out what’s really going on and who’s really advocating on their behalf and who’s really just sticking on the lapel pin for show. Another way is to delve more deeply into their particular voting record for yourself at Project Votesmart. It’s time consuming, but if you’re passionate about it, it will be worth your time to cut through “the filter” to parse votes yourself. This entry was posted in D.C., family, Iraq War, veterans and tagged Iraq War, military families, Non-partisan, veterans, Veterans Administration, Veterans Day, vets, VMFP. Bookmark the permalink.